Panorama of the battlefield of Salamanca as seen from a position just south of the Lesser Arapile. The Greater Arapile can be seen on the left. The ground over which Clausel attacked lies ahead. To the right is the village of Arapiles, beyond which stands the hill from which Wellington controlled the battle. On 17th June 1812, Wellington's advance into Spain reached the city of Salamanca. Wellington now found himself opposed by Marmont's "Army of Portugal". With the two armies being comparable in strength, neither commander could risk a full-scale attack without first manoeuvering his opponent into a disadvantageous position. After several weeks in which Wellington and Marmont shadowed one another, the morning of 22nd July saw engagements breaking out between the two armies as they curved eastwards in parallel to the south of Salamanca. As the morning of 22nd July wore on, Marmont imagined an opportunity to out-flank Wellington by propelling his leading divisions westwards. Unknown to Marmont, Wellington had guarded against such a threat by holding back Packenham's 3rd Division. As a consequence of Marmont's move, the French line became grossly overextended, a fact not lost on Wellington as he observed events from behind the village of Arapiles. Wellington now seized the chance to attack. In mid-afternoon, D'Urban's cavalry and Packenham's 3rd Division slammed into the leading French division, commanded by Thomieres. The French, taken completely by surprise, were routed, with Thomieres himself being killed. A short time later, Leith's 5th Division and Bradford's Portuguese Brigade were launched against Maucune's division. The hard-pressed French were then torn asunder by the supporting charge of Le Marchant's heavy cavalry. The British cavalry swept on to wreak further havoc in Brennier's division. Three French divisions had now been broken, though the British were to mourn the loss of Le Marchant, killed in the charge. Right: Replica of the Eagle of the French 22nd Regiment, captured at Salamanca by Ensign Pratt of the 2/30th Foot, Leith's 5th Division, courtesy of the Queen's Lancashire Regiment. To the east, the French line was holding. After a tremendous struggle, an attack by Cole's 4th Division had been turned back by Clausel and Bonnet. The supporting attack on the Greater Arapile hill by Pack's Portuguese Brigade had also been repulsed. With both Marmont and Bonnet wounded, Clausel assumed command. Rather than retire from the battlefield, Clausel threw his own division together with that of Bonnet into a desperate counter-attack. This last throw of the dice failed as Clinton's 6th Division moved in to face the onslaught and broke apart the attack. The battle ended with a general British-Portuguese advance from the north and west being delayed by a gallant rearguard action by Ferrey's division. Wellington's army of 48,600 suffered 5,200 casualties but inflicted in the region of 14,000 casualties on Marmont's 50,000-strong army. The Battle of Salamanca, also known as the Battle of the Arapiles, was probably Wellington's most impressive military success. No longer could he be regarded as a master only of the defensive battle. Salamanca has to be one of the most rewarding battlefields to visit in the Peninsula, not least through having escaped enlistment into the Spanish motorway system. It is, in fact, essentially unchanged from the time of the battle. The battlefield lies a few miles south of the magnificent university city of Salamanca, and is best approached by turning east off the N630 onto the signposted road to Arapiles. Follow the road through the small village until the tarmacked surface peters out under the Lesser Arapile at the site of the former railway station. The outlook from here to the south and west is that seen by the British 4th and 6th Divisions as they faced Clausel's desperate counter-attack. A short distance back towards Arapiles (2.9km from the N630) a track to the south leads directly to the foot of the Greater Arapile at its western edge. From here a steep path leads to the summit, and on to the memorial to the battle. In Arapiles itself, a small but interesting museum has recently been opened. As well as describing the battle through dioramas, relief maps, wall displays and a video presentation (available in English on request), the museum has a collection of items recovered from the battlefield. Unfortunately - as of March 2008 - opening hours are very limited (Saturdays only, from 10.30am to 2.00pm). "Wellington in the Peninsula 1808-1814" by Jac Weller, published by Greenhill Books 1992, ISBN 1853671274. "A History of the Peninsular War, Volume V" by Sir Charles Oman, published by Greenhill Books 1995, ISBN 1853672254. 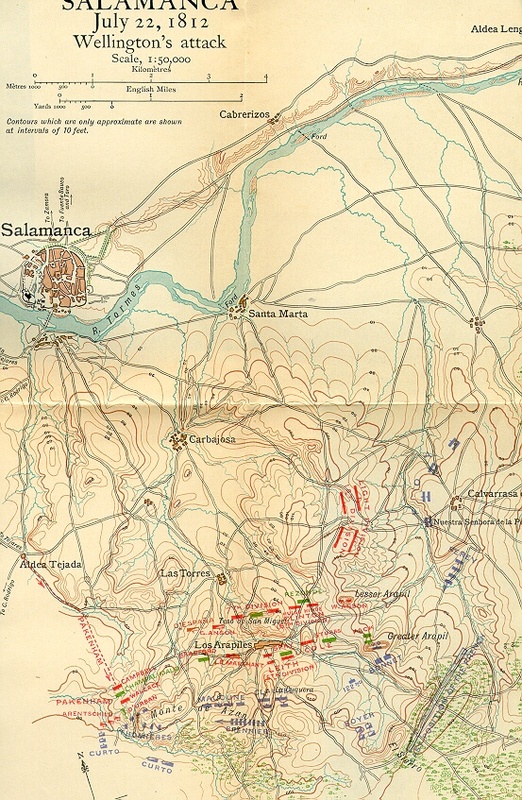 Detailed map of the Battle of Salamanca courtesy of The Napoleon Series. Batalla de Los Arapiles, a Spanish-language site devoted to the Salamanca campaign.